K670 OSU at New Cumnock, possibly 2009 will be its last year 'ON THE RUN'as quite a few volvo's are awaiting disposal at Cowcaddens workshops. Added by Steve Bonner on 25 January 2009. Hi Steve i do have a few more pics of the volvos'but will take some more and post them later. Added by Tommy Swindle on 25 January 2009. Crikey a 'K' plate still on the run!!! and I thought we were bad with an 'N' plate for our station. Mind you, prefer the look of the Volvo in comparison to what we have. Added by Stevie Murray on 25 January 2009. Hi Steve we have just taken our last 'J'plate scania out of service, this being J163 GUS which was allocated to Muirkirk retained station in East Ayrshire.What type of appliance is at your station ? Added by Tommy Swindle on 26 January 2009. Added by Steve Bonner on 27 January 2009. We're currently running with a series 3 scanny. The oldest operational, i.e. on the run, machine in L&B's fleet. The shape of our appliance bay dictates the machines that will fit in it unfortunately. As much as am kinda fond of the scanny ( remember them from growing up in Glasgow ), I really like the look of the volvo machines. Seem more fit for purpose. Added by Stevie Murray on 27 January 2009. Hi Stevie i take it you work for L&B ? 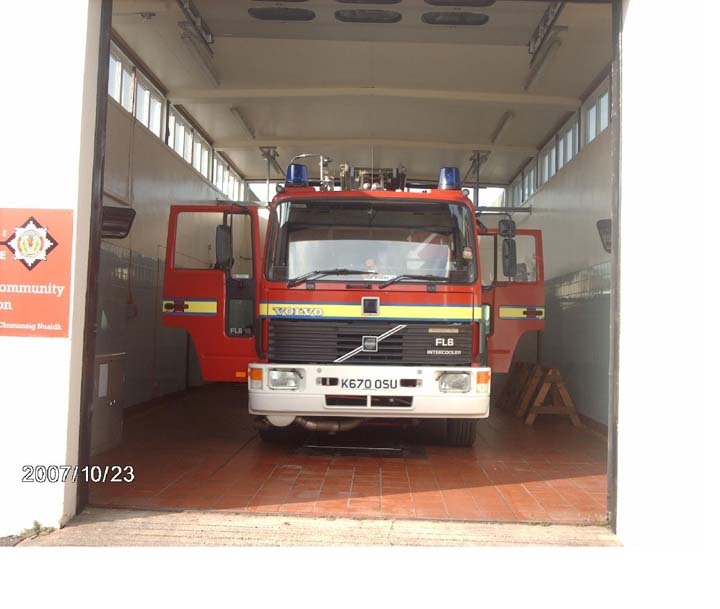 Do you why your TL S62 ASG was lying at SFR Barrhead fire station last week ? CHEERS. Added by Tommy Swindle on 27 January 2009. Hallo Tommy, yeh work with L&B at the only retained station within the city of Edinburgh. Not sure why Crewe Toll's Scanny TL would be through at Barrhead. No-one has said if it has been sold. lol. will try and find out though. Added by Stevie Murray on 28 January 2009. Volvos M335/336 DSU have been taken off the run and have blue lights etc removed and are awaiting disposal at SFR HQ. Added by TOMMY SWINDLE on 11 March 2009. Now 'off the run' This appliance is supposed to be going to fire cadets in East Dumbartonshire. Added by Tommy Swindle on 03 January 2010. Added by Tommy Swindle on 07 February 2010. Hi there, am I correct in thinking that Lamlash (K661OUS); Campbeltown (K662OUS) and Garelochhead (K667OUS) are the only K Volvos left on the run? Added by Iain Middleton on 07 February 2010. The only Volvos left on the run now are K662OUS at Cambeltown and K667OUS at Garelochhead but the Training School have K664 and K670OUS just now. Added by Paul Miller on 21 April 2010. Added by Kevin Dickie on 07 June 2010.